What sets the productions of Bard on the Beach in Vancouver, BC apart from other Shakespeare performances is their style. To be honest, the average person going to work unclogging a drain, filing papers, ceaselessly one-upping a coworker just to keep on top of the pedantic pyramid, doesn’t have time for Shakespeare. (Hmmm, it’s actually quite ironic Shakespeare writes many of these seemingly mundane human behaviours into his plays so really, we should be constantly reading and watching Shakespeare so as to be aware of the ruts we are in. But that’s a discussion for another time.) What Bard on the Beach does so well is to appeal to the people while staying true to Shakespeare. Sure, I see a few people nodding off during a long-winded soliloquy, however, I rarely find a person come away from a production regretting they had gone. Bard of the Beach in their 2016 slate has again produced a magical musical version of The Merry Wives of Windsor set in Windsor, Ontario in the late 1960s that holds both the comedic Shakespeare in tact with the bar style kitsch Canadiana of Windsor. The lifeless eyes of the stuffed moose head looks down on the Garter in where the wives Mrs. Ford and Page take the stage to kick off with These Boots are Made for Walkin’ while young Slender and Dr. Caius pine for Miss Page and the fat Falstaff looks to swindle the lot. Much of the play’s success rides on Falstaff as Shakespeare’s popular buffoon (whom it is rumoured the Queen really liked) holds much of the energy between the various parties. He pursues the wives while Mr. Ford in disguise plies him for information about his schemes and all the while, Mrs Ford and Page are playing Falstaff for the fool he is. Ashely Wright plays the bombastic Falstaff and does an excellent job of capturing the sleazy businessman who thinks himself the true ladies man while being totally clueless at the same time. While the entire cast from Bard on the Beach is exceptional, a few others stood out that night. Andrew Chown was spectacular as Dr. Caius in ridiculous valour suits and a French accent while Ben Elliott channeled his Jim Carrey (you know. When he was funny) to play a gangly Slender who unenthusiastically pursues the mistress Page. And the two wives of Windsor, Amber Lewis and Katey Wright (not this Katie Wright), were outstanding as they ran the stage both in verse and in song twisting Sir Falstaff every which was and into the laundry bin. The joy of the show came from the musical that worked it’s way through script as characters would come from the wings to take up instruments and play and the bar keep and host of the Garter Inn, played by Anton Lipovetsky, did a great job with his guitar keeping it all together. The cast used the music of the late 60s to enhance the story and give the actors a chance to express their character through song which worked well with keeping the audience engaged. You could tell by scanning around the room and seeing the smiling faces that this production was a hit and one that is a must see this summer down in English Bay in Vancouver, BC. 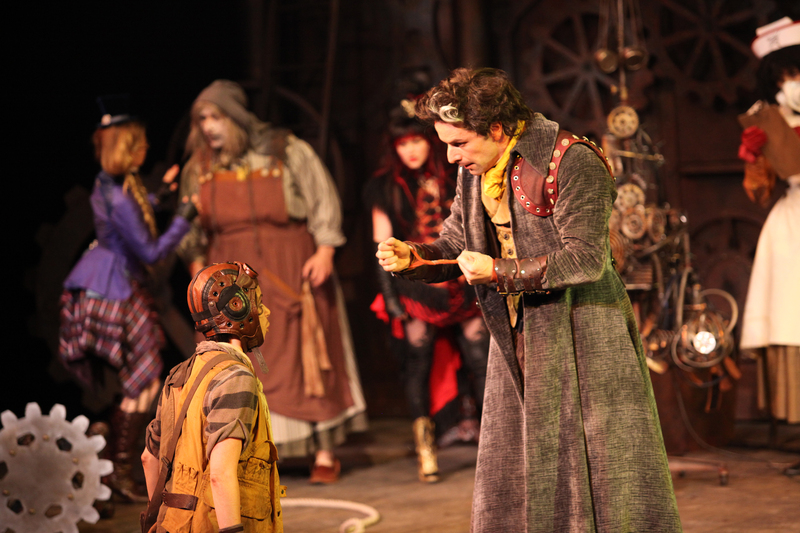 With Bard on the Beach in full swing during a sweltering Vancouver summer, Director Scott Bellis has taken Shakespeare’s The Comedy of Errors and given it the gears and gadgets of the Steampunk genre. Well said and I did think the same going into the main stage on Vancouver’s beautiful Vanier Park looking out over English Bay. How many times have we seen a kind of kitschy genre played out once too many much to the audience’s chagrin? Yet Scott Bellis and the Bard on the Beach cast delivered a delightfully entertaining performance using the Steampunk back drop to add colourful characters behind the scenes and flashy special effects right in the audience’s faces. The widgets, levers and wire-rimmed glasses worked in and around Shakespearean forms of love, hate, jealousy, misdirection and slap stick found in his comedies. The stage lighting tricks and quirky use of the monstrous Nurse, did nothing to take away from the fun of the mistaken identities and the foibles the followed. It was not a nauseating ride through the planet’s core filled with distracting gooberfish and the bigger fish that eat the gooberfish. It was a laugh fest coloured with smoke and lightening thanks to the design team including Pam Johnson (Scenery), Gerald King (Lighting), Malcolm Dow (Sound). Antipholus and Dromio take centre stage. The play begins with the aging Egeon (Scott Bellis) from Syracuse thrown before the Duke of Ephesus and sentenced to death simply for being a Syracusian. Sounds about right. Pleading for his life, Egeon tells his tragic tale of loss and how he came to be in Ephesus. Many years ago on a voyage at sea a terrible storm separated Egeon from his wife and son leaving him with his other twin son and twin servant. Yep. All believable so far. Both children were called Antipholus and the servants Dromio and when Egeon’s remaining son left for Ephesus and failed to return, he has been on a decade long search for him. The ever so generous Duke is moved by Egeon’s tale and grants a stay of execution granting him one day to come up with money for bail proving that all politicians are motivated by the promise of monetary reward (how can one not be cynical in these electoral times). Meanwhile across town, Antipholus of Syracuse (Ben Elliott) and his servant Dromio (Luisa Jojic) have come ashore unaware that they have stumbled upon the home town of their twin brothers Antipholus of Ephesus (Jay Hindle) and Dromio (Dawn Petten). In the ensuing confusion created by mistaken identity schtick that Shakespeare does so well, the antics of the Dromios and Antipholi drives the energy and comedy of the play right to the closing curtain. Hats off to Elliott and Hindle as they are thrown this way and that and even more so to Jojic and Petten who were spectacular in making the horrors of slave ownership and abuse quite funny as they were slap sticked around the stage. Hmmm. Feels wrong. 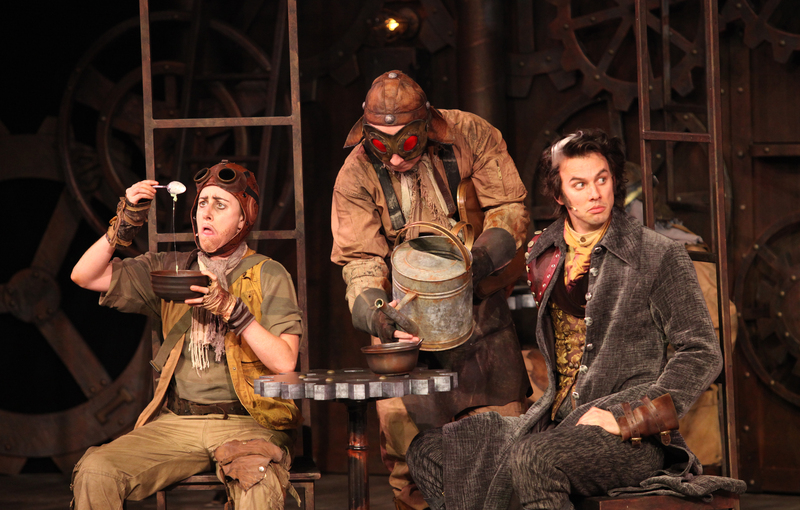 Costume designer Mara Gottler deserves kudos for capturing the feel of Steampunk especially with the minor characters nefarious Dr. Pinch, the mysterious Abbess and the monstrous Nurse Poppy. 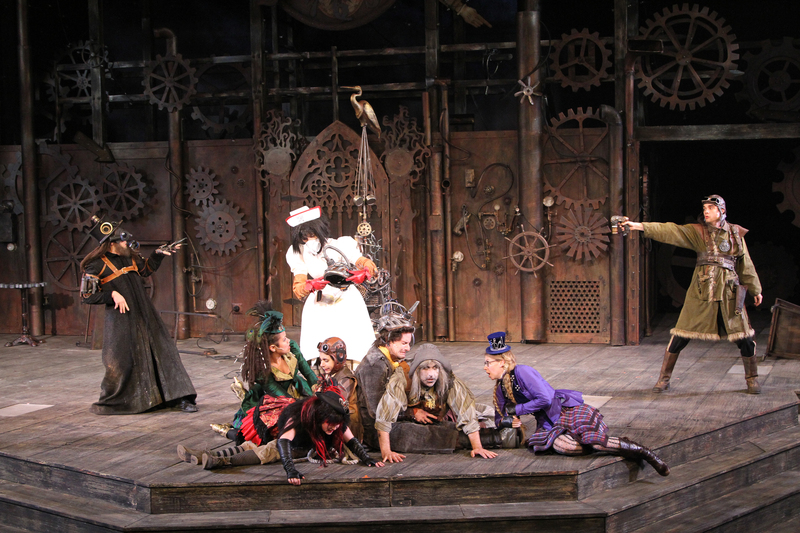 The iron gears and twisting metal made for a darker backdrop to the play and added a mysterious element juxtaposing the comedic performances in the foreground. Gottler does well by taking the darker science fiction/fantasy look and decorating the characters with horned rimmed glasses, old aviator helmets and trench coats. When mixed with the sights and sounds of the stage crew, Bard on the Beach delivers a production of The Comedy of Errors that is a unique and wild and fun and a show that demonstrates how this company continues to keep Shakespeare alive in Vancouver.